Thank you for considering Jo Lord & Lords In Love as an influencer for your event, accommodation or experience. 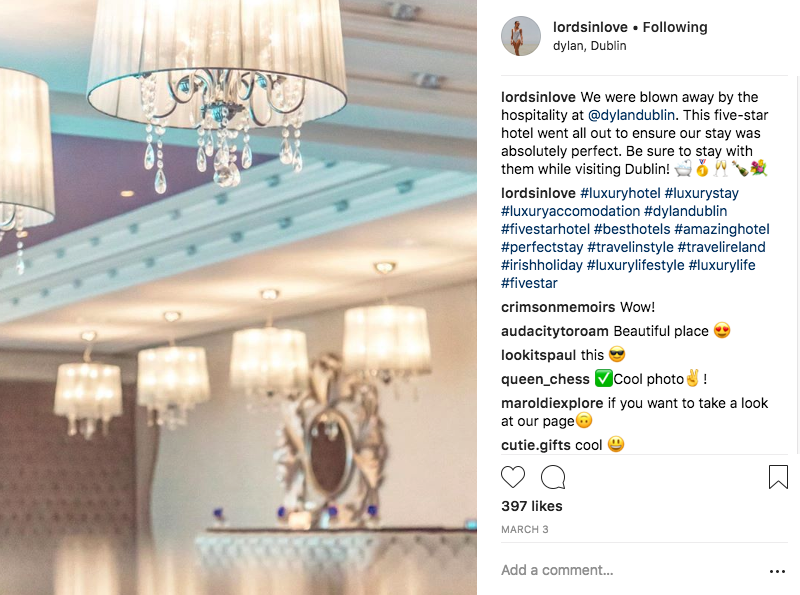 Please view a recent stay in Dublin, Ireland below as a sample of what to expect for your company's content and promotion. Please note that results may vary and not every package is identical to as demonstrated below. This classy five-star hotel in Dublin provided Jo with a wonderful room and multiple dinners. In exchange of this complimentary service, Jo promoted their hotel on both his @lordsinlove and @jolord profiles. He created photography and videography for Dylan, and provided them a commercial license to use for their own distribution. They have since used his media on their social media pages for their own promotion and content. Before arriving at Dylan, their Digital Sales supervisor provided Jo with a list of shots they'd love to have. This was a wonderful "check list" of sorts for Jo to use while staying at Dylan to ensure they would be thrilled with the content he created. Whenever Jo works with a hotel or restaurant he provides the media he captures during his stay with a commercial license. This license is worth thousands of dollars annually, but he provides it complimentary. During his time in Dublin, Jo created a video centered around his time with his dad. It was released on Father's Day 2018, and Dylan Hotel was the sponsor. As you can see in the video, their hotel was showcased as apart of the story. Their media team was also provided with all of the video clips captured for their own use. Within 60 days of having stayed at Dylan Hotel, Jo promoted these posts on his Instagram. He also created Instagram Story posts every day he stayed at Dylan. Thank you for considering Jo Lord and Lords in Love for your company's promotion. Please don't hesitate to reach out for their press kit, audience analytics and more.